This page describes WiFi QoS. This WiFi Quality of Service(QoS) requirements are defined in WLAN IEEE 802.11e standard. WME (WiFi Multimedia Extenstions) or WMM (WiFi MultiMedia) and WSM (WiFi Scheduled Maintenance) concepts of WiFi QoS are described. ➨To have minimum collision in comparison with older 802.11 based WLAN system. ➨To achieve higher performance in delivering voice streaming, video streaming, Best Effort (e.g. web browsing), Background (e.g. email) applications over WiFi link. 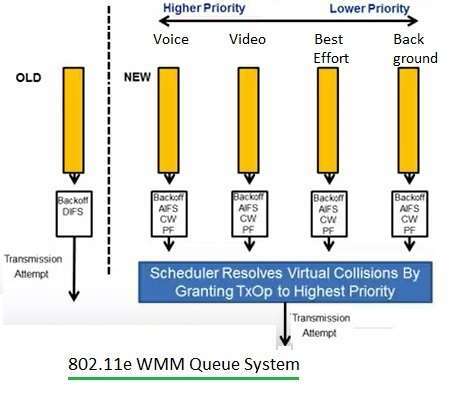 Figure-1 depicts WiFi QoS WMM Queue System. Following are the features of WME/WMM. • It uses EDCA (Enhanced Distributed Channel Access ) protocol. It is mandatory feature to be introduced in 802.11e compliant devices. • Traffic carried over WLAN link is categorized into four categories viz. Voice, Video, Best Effort, Background applications. • Priorities have been defined for each of the traffic type. As per this high priority traffic waits less time compare to low priority traffic. ➨ Implementation: Each traffic priority has different backoff value. High priority will use shorter backoff value. • Transmit opportunity have been created for each type of traffic. When station gets the access of channel, it can transmit packet during its assigned TXOP (Transmit Opportunity). ➨Implementation: The TXOP is different for each priority level, higher the priority, longer is the TXOP. Following table-1 mentions Access Caterogy for different traffic types and their priorities. Following table-2 mentions EDCA parameters (CWmin, CWmax, AIFSN, Max. TxOp) for different Access Caterogies. • It uses HCCA (Hybrid Controlled Channel Access ) protocol. It is optional feature defined in IEEE 802.11e standard to be implemented on 11e compliant devices. • In this protocol, station(STA) or client negotiates traffic profile with WLAN Access Point (AP) or Router. Traffic profile includes bandwidth, latency and jitter requirement to be met over WiFi link. • Once AP satisfies or agrees with the STA requirement, it sends OK signal otherwise it sends busy signal to the STA. • Once the conditions are satisfied, they can communicate over the wifi link. ➨Automatic Power Save Delivery: It introduces advanced power management for VOIP phone. The VOIP phone transmits and receives data from AP instantaneously and enters into sleep state until there is further data to be transmitted. ➨Block Acknowledgments: This feature allows entire TXOP to be acked in one single frame. ➨No ACK: This feature allows receiver not to send ack for any frame. This is useful for delivery of highly time critical data frame. ➨Direct link setup: This feature allows wireless wifi devices which are associated with same AP (Access Point) or router to directly communicate with each other by-passing AP.